David Lechmere Anderson b.1914 - d.10th October 1991 - aged 77 years. We already know of Dr. Roberts family, but who was James, and why is he buried here, in Stainforth cemetery? When he was 26 years old he must have heard stories coming from across the Atlantic Ocean, from other intrepid Scots who had found their fortunes among the gold fields of Canada. Leaving his home and family, he traveled to a wild and remote part of Canada in search of gold and wealth. It was 1863 and the Gold Rush was well under way. James joined the throngs of immigrants traveling west to British Columbia, from where tales came of a bonanza for all, with gold so easy to find that you could literally just bend down and pick up the nuggets. One person who has expert knowledge of the days of BCs gold rush is Richard Wright. He has spent a large part of his life researching the history of Barkerville, the small town situated in an area of BC called Cariboo, where James Anderson lived between 1863 and 1871. Richard wrote to me shortly after I had launched the Stainforth 2001 site, inquiring about the Anderson family. He was particularly interested in James, who I learned was regarded as a folk hero in BC. Like his grandson, our very own Dr. Robert, James was something of a playwright and a poet. In fact, around Cariboo he is still to this day referred to as, "The Bard of Barkerville". Richard Wright and his partner, Cathryn Wellner, both talented musicians, have produced a CD , "Rough But Honest Miner", and an accompanying book, "Castles In The Air", containing music from the gold rush period, as well as the lyrics to several of James Andersons songs. "Castles In The Air" is much more than a mere list of lyrics to be browsed while listening to the CD. It is actually a fascinating collection of stories and insights into the lives of those who sang and played in the gold rush camps and towns of British Columbia. For us in Stainforth, it is a valuable insight into the life of a man whose descendants helped to shape our history. 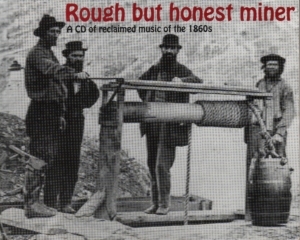 The CD opens with James Andersons "The Rough But Honest Miner", which he penned in 1867, and set to the tune of a popular Scots song by James Ballentine, called "Castles In The Air". We are told this was a song sung by many miners, overlanders, (immigrants who made the long trek west overland from the eastern coast), and stage performers. Air - "Castles in the Air"
Sung by Mr. James Anderson, at the Theatre Royal, Barkerville, 13th Feb. 1869. "Buildin' castles in the air". "Wi' its castles in the air." During the years spent at Barkerville James is noted for being a prolific writer of "labor poetry", that is poetry about the hardships endured by ordinary working people. 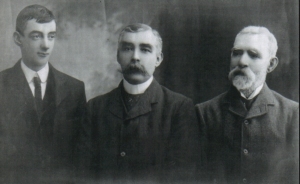 Historians, such as Wright and Wellner, have found Andersons work to be an invaluable aid to putting together a picture of life in BC during the gold rush. In some of his works, collectively known as "Sawney's Letters and Cariboo rhymes", James describes the people who flocked to the new townships, and in his written Scots dialect he tells of "The German Lasses", or "Hurdy Gurdy Girls", known to some as "The Dancing Ladies of Cariboo"
From Germany, the hurdies, O! In the same year he also wrote this ditty, which tells of a fellow Scotsman from whom Anderson acquired a claim. I hope to add a page of complete poems and songs by James Anderson at a later date, but for now I have to move on. Prior to the writing of this page I spoke with several members of James family. According to their own records James returned to Scotland after spending eight years in the gold fields of BC. Their last known address for James is "Tarvit Mill House, Couper", where he resided in 1896 with his wife, Lucy (nee Lechmere). 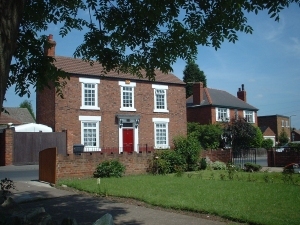 The next we hear of James is when he died at "Field House", on Field Road, Stainforth on the 12th September 1922. According to his death certificate, his grandson Dr. Robert Anderson was present when he passed away. I was previously under the impression that James had moved to Stainforth to be near to his relatives, and that he had bought Field House. From Pamela White, James granddaughter, who you may recall I mentioned when writing about Dr. Robert, I found the familys version of events and how James came to buried here in Stainforth. In fact James was here in Stainforth to visit his grandson. Unfortunately he took ill and passed away before he could return to his native Scotland. The death was registered two days later and James Anderson was buried in Stainforth cemetery later that week. There is an "in family joke" with the descendants of James, in that he was buried early in the morning, as that week was, of course, Leger week, and nothing could keep the family away from Doncaster Races where Leger week was concerned. I would like to thank everyone who helped me to put this page together, especially Dr. Pamela White, Mr & Mrs Robert Anderson and Mrs P.Madill..
My humblest thanks go to Richard Wright and his partner, Cathryn Wellner, for being so generous and helpful, and for sharing their knowledge about this most remarkable Scotsman who rests forever in our tiny village.